Ranch A is the result of a car breaking down in the Black Hills. Ranch A is named for its founder Moses Annenberg, a media mogul and founder of the Philadelphia Inquirer and Daily Racing News. 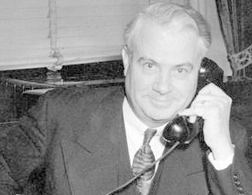 His son Walter later built the business founding TV Guide, Seventeen Magazine, and television stations that led to the founding of American Bandstand. Today the Annenberg Foundation has donated billions to education and other causes worldwide. But it all started when Moses and Walter had car trouble one evening in the Northern Black Hills. A chance meeting ended up creating a legacy that lasts to this day. Millionaire publisher Moses L. Annenberg and his son Walter were driving to Yellowstone National Park when their car broke down near Spearfish, South Dakota. While waiting for the car to be repaired, Moe, as he was generally known, had a trout dinner that he is reputed to have declared, “the best I’ve had since I left Europe.” Moe immigrated to the United States in 1900 after having been raised in East Prussia (German Empire), where he helped feed his family by fishing. Upon being told that the trout came from Sand Creek, near Beulah, Wyoming, he hired a car, went to Sand Creek, and met with George LaPlant, who had produced the trout in his commercial trout farm. Moe announced his intention to buy LaPlant’s property and persisted until, according to local legend, George put the price at an astronomical figure to get rid of this pushy easterner. Moe agreed to the price and George had sold the trout farm! According to the deed dated September 1, 1932, Grace M. LaPlant and George LaPlant received $24,000 for 639 acres, nearly $38.00 per acre! That’s a value of $450,000 today. Moses (l) and Walter (r) Annenberg. Photo courtesy Getty Images. Moses (l) and Walter (r) Annenberg. On October 10, 1932, Moe purchased an additional 40 acres from Fred Schloredt and Elfriede L. Schloredt for “One Dollar and Other Good, Valuable Consideration”. Based on the federal revenue stamp affixed, which was required at that time to validate a real estate sale, the price was about $437.50 or $11.00 per acre. 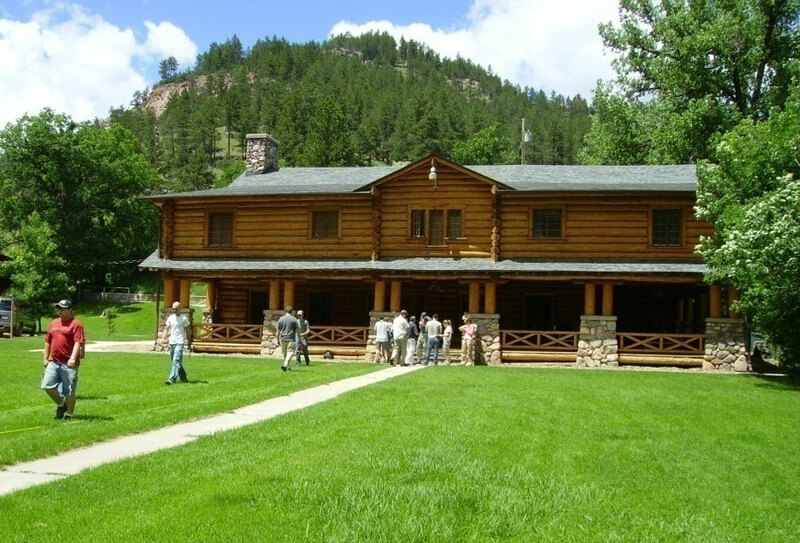 Annenberg retained Ray Ewing, the premier architect in the Black Hills, to design what became Ranch A. The wonderfully long, straight, uniform Ponderosa Pine logs were secured from a single draw near Aladdin, Wyoming, owned by Ted Butterfield. Ironically Butterfield is the grandfather-in-law of the Ranch A Restoration Foundation current board chair. The Juso brothers, master log builders from Finland, hand peeled the logs with specially made tools. They coped them to individually mate with the logs below and sealed the joints with two strips of oakum. The joints are so precise that there are no drafts through the walls. The logs had not cured sufficiently and after the lodge was completed the side cuts were made with six two-man crosscut saws and are precise as to be nearly imperceptible. Go here for more detail on the construction of the main lodge. Thomas Molesworth was commissioned to design and build the furnishings and decorations for the lodge. This was Molesworth’s first major commission and was the foundation and springboard for his illustrious career. Many of the furnishings are now in private hands but some are owned by the state of Wyoming, with outstanding examples on display at the Crook County Museum in Sundance. For more on Molesworth’s work at Ranch A go here. Electricity was supplied by the ranch’s hydroelectric plant. The telephone and teletype connection was accomplished by a copper-clad steel wire connection to nearby Spearfish, SD. Moses Annenberg’s fortunes, in all senses, took a turn for the worse when President Franklin Roosevelt began using the Bureau of Internal Revenue (now the IRS) against his political enemies, going so far as to indict former Secretary of the Treasury and Mellon Bank president Andrew Mellon, who went to trial and was acquitted. Moses Annenberg became a prime target as well. He was conservative and very effectively anti-New Deal with his newspapers, including the Philadelphia inquirer which he bought while at Ranch. The government’s pursuit of the case was relentless and ruthless. Moses agreed to plead guilty to stop the persecution of his son Walter. Moses was sentenced to federal prison for tax evasion and served several months. His health, having been broken by the ordeal, allowed him to essentially be paroled to die. Moe died in 1942 and Walter, desperately scrambling to save the publishing business, began selling all non-core assets. Governor Nels H. Smith of Wyoming was approached to buy Ranch A. His initial response was, “Any offer I could make on that place would be an insult”. He ultimately made an offer to buy Ranch A from Moe’s estate. The offer was accepted by Walter Annenberg, who was the administrator of the estate. Meanwhile Walter Annenberg was still under pressure from a government intent on destroying his publishing empire. They did not want Walter to be able to sell anything and certainly not to a prominent Republican governor. Despite this pressure, Walter honored his deal with Governor Smith. Later, when President Nixon nominated Walter Annenberg to be ambassador to Great Britain, former governor Smith wrote to his friend Senator Cliff Hansen, and recounted the details of the Ranch A sale and said essentially, “Walter Annenberg is a man of courage and integrity. He will serve our nation well. I urge your support of the nomination”. Walter Annenberg was confirmed and served for 5 1/2 years. Governor Smith had purchased Ranch A with two partners; Willis “Bill” Walker, president of Plains Airways of Cheyenne, Wyoming, and Sam Kenner, President of Salem Engineering of Salem, Ohio. 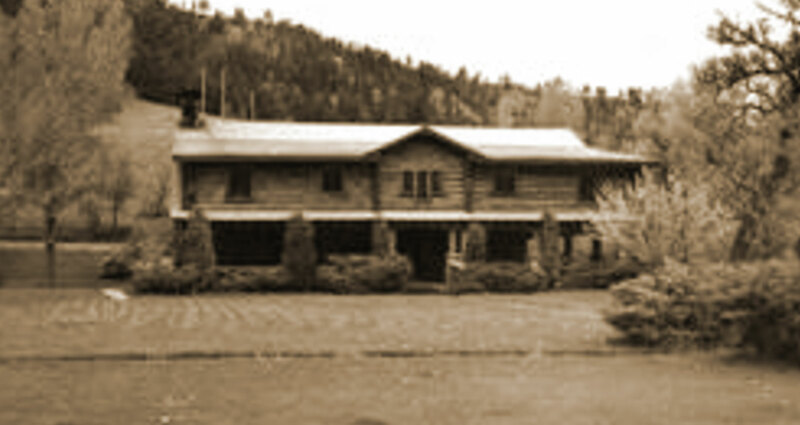 Bill Walker sold his interest and built the Saratoga Inn in Saratoga, Wyoming. 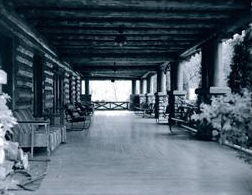 The Saratoga Inn was built on State Land under an arrangement quiet similar to the special use lease under which the Ranch A Restoration Foundation operates Ranch A. The new partner was Lorenz Iversen, president of Mesta Machine Company of Pittsburgh, Pennsylvania. “Ivy” was a world class industrialist, a major defense contractor and an innovative genius. His Iversen valve design is still being used even though the patent expired long ago. Little David, a howitzer with a 36 inch bore, was the world’s largest modern gun. There were only three built and they were produced in Pittsburg at the Mesta Plant. 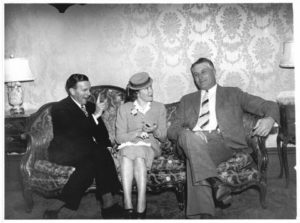 Wyoming Governor Nels H. Smith (r) welcomes George Burns and Gracie Allen to the Governor’s Mansion on May 11, 1940. The comedy-duo was on a whistle-stop tour of Wyoming during Allen’s “campaign” for President that year. Ohio Governor John Bricker (above) was a guest of Governor and Mrs. Smith at Ranch A in 1944 as they helped build support for his candidacy for President. 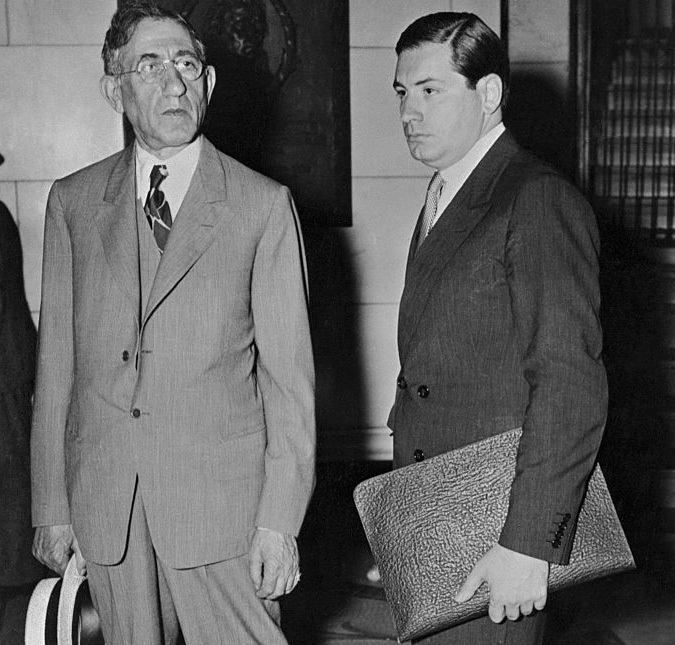 Thomas Dewey would later choose Bricker as his running mate during the 1944 presidential campaign. 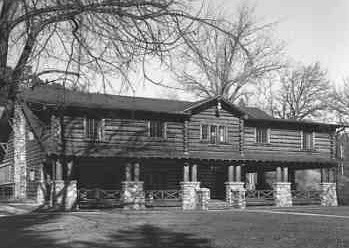 Ranch A was Governor and Mrs. Smith’s personal residence after he left the governor’s office in 1943. The other partners, Kenner and Iversen, visited for vacations or to entertain special guests. All visits and entertaining were private, but often quiet high-level. One of the most notable is the meeting held by Governor Smith to build support for the presidential campaign of his friend, Governor John Bricker of Ohio. It is fair to say that all the political power in the Black Hills region was present at that meeting. The effort was at least partially successful. John Bricker was the Republican nominee for Vice-President in 1944. 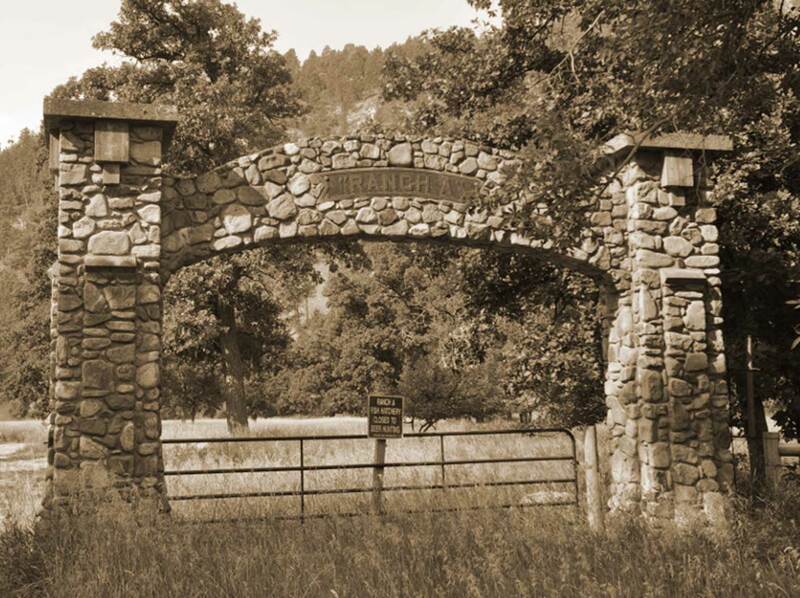 In 1951, Governor Smith sold his interest in Ranch A to Harold Dittus, a Spearfish businessman. Relations with the existing partners, Iversen and Kenner, deteriorated rapidly. This resulted in a sheriff’s auction that was to be held in October, 1952 to liquidate the partnership. Earlier, wild local rumors notwithstanding, it was at this point that Ranch A’s only brush with organized crime occurred. Denver mobsters Clyde and Eugene Smaldone were under extreme pressure from a combined State-Federal crackdown on organized crime in Colorado, including the Smaldone’s gambling operations in Central City and elsewhere. At the same time, strong rumors were circulating that Wyoming was going to legalize gambling. What better place to have a casino than the beautiful Ranch A lodge? About this time, the Smaldones were seen having dinner with two shady local characters at the Royal Club (now the Buffalo Jump Saloon and Steakhouse) in Beulah 5 miles to the north of the lodge. Ranch A partner Lorenz Iversen kept track of what was going on wherever he had interests and Ranch A was no exception. As an international industrialist and defense contractor, he had direct, high level FBI contacts. He also intended to buy Ranch A at the auction. It can hardly be written off as coincidence that the Smaldone brothers were arrested shortly before the auction. “Ivy” was a man of immense wealth, but was also very disciplined and stubborn. He had set a limit of $126,000 that he would bid at the auction. The successful bidder, however, was Peter Smith, son of Nels H. Smith, at $126,500. 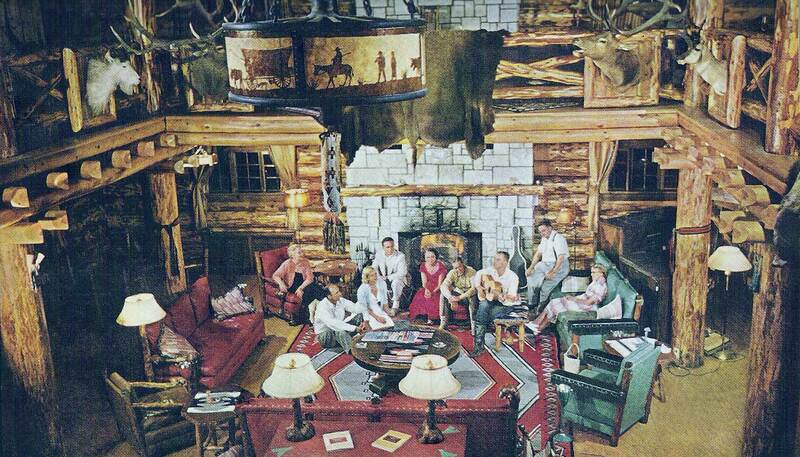 Peter Smith commercialized Ranch A as a dude ranch and executive conference center. With Ellsworth Air Force Base only 65 miles away in Rapid City, and Pete’s extraordinary ability to develop relationships, it was no surprise that Strategic Air Command conferences were among the many high level meetings held at Ranch A during this period. 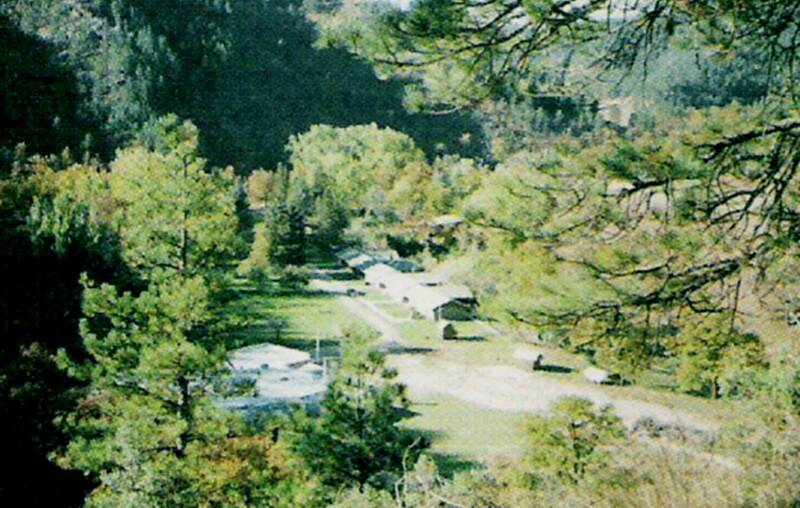 National Geographic Magazine included pictures and information about Ranch A in an article entitled Back to the Historic Black Hills in itsOctober 1956 edition. Peter Smith sold Ranch A to the Porter Family, owners of Porter Motor Company at Mitchell, South Dakota. Porters continued the operations, then in 1963 sold Ranch A to the US Fish and Wildlife Service. The lodge was remodeled for office spaces, labs for fish genetic, nutrition, and pesticide study programs were built, and the Molesworth furnishings were either sold as surplus or relegated to storage. 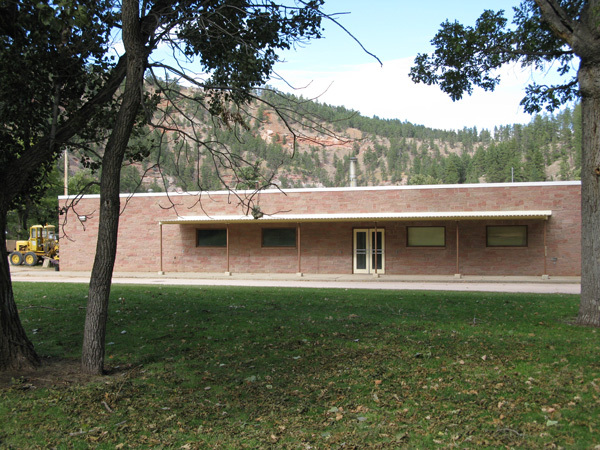 In 1979, Ranch A became a part of the Spearfish Fisheries Center Complex. Research continued until the hatchery facilities were closed for good in 1986. Federal legislation transferred the property to the State of Wyoming in 1996, with the restriction that it could be used for educational purposes only and that no improvements could be made to the property. This serious impediment to the operation of the facilities was subsequently removed by the federal legislation and the Ranch A foundation board is now offering more service and uses to the public. The Ranch A Restoration Foundation, founded in 1992, has managed the property since 1996 and recently secured a new 25-year lease from the State of Wyoming. With a long-term lease and more activities and services available, Ranch A looks forward to welcoming you. In 1992 the Ranch A Restoration Foundation was formed. It has had management of the property since that time. In 1997 Ranch A was listed on the National Register of Historic Places (NRHP). Read about our NRHP listing here. Important fisheries research occurred at the Ranch A facility during the late 70’s and early 80’s. Christopher Ogden, Legacy: A Biography of Moses and Walter Annenberg (1999). Cooney, John E. – The Annenbergs. New York: Simon & Schuster, 1982. Winter-Berger, Robert N. The Washington Pay-Off: An Insider’s View of Corruption in Government. New York: Dell Publishing, 1972. Wilkinson, Gerry. “The History of the Philadelphia Inquirer” – Philadelphia Press Association.